She was born and brought up in Lincolnshire, but moved to Manchester at age 16 after gaining a place at Chetham’s music school where she owes much to the teaching of Nigel Pitceathly. 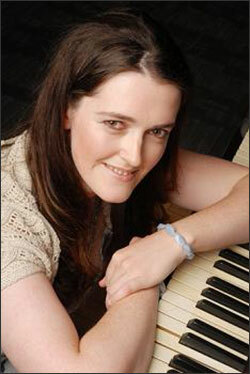 Since then, she has received tuition from internationally acclaimed pianists such as Ronan O’Hora, Murray McLachlan, Stephen Hough, and Paul Janes. Rachel has a wide experience in the fields of chamber music and solo performance and has performed at various venues throughout the UK. Personal tastes range greatly from Bach to Percy Grainger, Poulenc and Scriabin. The complete All-In-One series of books (ten in total) evolved from the first edition of All-In-One to Grade 5 which is an accumulation of five years work, published in 2009. Since then the book has been continually refined as Rachel discovers what works best with her own students and it is now available in its third edition (published July 2016). It was originally written for the benefit of Rachel’s own private pupils but soon proved very popular in weekly lunchtime theory classes taught at a nearby local Girls’ grammar school. Rachel has a love for art which has naturally influenced All-In-One (All-In-One to Grade 5 itself includes no less than 130 illustrations) yet Rachel is a firm believer that drawings/paintings should always aid tuition and never be trivial decorations. Illustrations throughout the book reinforce important concepts learnt (a few examples of Rachel’s drawings can be seen on Facebook or here on this website ). Personal favourite artists include Shirley Hughes (author and illustrator) and Salvador Dali. Rachel Billings taught in the North-West until she married in 2013 and moved to Warwickshire where she is now the busy mother of two young children. Rachel welcomes comments/ feedback (good or bad) about the All-In-One series from either teachers or students. All messages are carefully considered and help Rachel to improve each edition.